In the world of roof mounted solar products there are two primary contenders, solar thermal and photovoltaic. 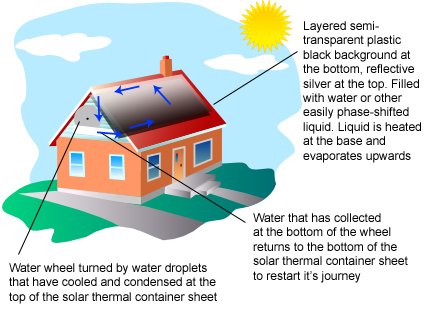 Solar thermal is essentially the use of heat energy produced by the sun hitting your roof to heat water or oil being passed over dark surfaces. Photovoltaic is the conversion of light wave photons into electricity through the process of bombarding electrons. 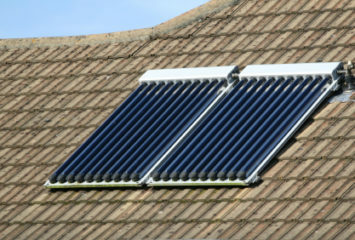 PV is more expensive and less efficient than solar thermal but has many more applications, for instance you could heat water using the electricity produced by solar thermal panels on your roof. By contrast, converting hot water or oil into anything other than hot water and heat is a bit more challenging. There are however several large installations of solar thermal electricity plants that use steam power and stirling motors to create electricity. 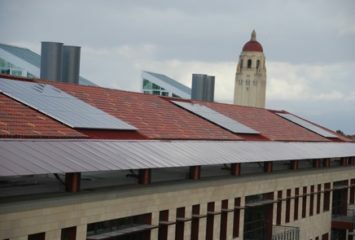 In any application of sun energy, electricity is the clear winner in terms of “sun currency” but the limitations of silicon used to produce PV wafers and the fancy technology built into solar panels makes them cost prohibitive. One unsung alternative to these methods is to use water or other easily phase shifted liquid to mimmic the natural water cycle at work in the Earth’s ecosystems today. For decades hydro electricity plants have been providing a clean natural source of energy for people all over the world. While damming rivers may destroy or alter natural river habitats, it does offer one alternative to nuclear or coal plants which create much more pollution. Every day water from the world’s oceans naturally evaporates as the sun shines down and heats the surface. Water vapor then rises up and forms clouds which drift over land and mountains. The water that lands above sea level has stored kenetic energy which can be captured by dams and then used to power large motors which create electricity. Basically, the water aided by gravity flows downward back towards the oceans and if caught in a dam is used to push padels connected to wire and magnets that create electromagnetic induction and thus electricity as they turn – this is the same energy you feel when you put two repelling magnets next to each other. Could this same natural process be used on a smaller scale to create electricity for home owners? Consider the following graphic and theory: What if a specially designed large plastic semi-clear tank was placed onto the roof of a house. The bottom of the tank would be painted black because that color obsorbs the most heat and would help evaporate the water while the very top edge of the tank (closest to the apex of the roof) would be coated with silver paint to reflect heat and keep it cooler. The tank would be partially filled with water and would be laid on its side as shown in the graphic below. As the water at the bottom of the tank (near the gutter of the roof) was heated by the sunlight it would evaporate and rise to the top of the tank just like in a steamroom. Once it reached the top, the air pressure would build and the walls would be cooler (due to the silver paint) and the water would condense against the tank walls and eventually drop down into a trough. Next, instead of sliding back down the plastic tank, the water would be guided down the small trough to the top corner of the roof where it would be collected and dripped down over a hyper efficient waterwheel mounted to the exterior side of the house. Over time as more and more water evaporated upwards, condensed, and dripped down the gutter the wheel would turn like a water wheel and power a motor to produce electricity just like a hydro electric dam. In this way the power of solar thermal energy could more directly be converted into electricity. This design would fit most houses with slanted roofs mimmicking the mountains found in nature and would only require the use of common materials such as plastic, paint, tubes, and a small motor which would be much more affordable than PV and silicon used in photovoltaic panels. While this technique has not been tested, it would certainly work to some extent because it mirrors the natural systems that we see around us everyday and rely on toe power hydro electric plants. Furthermore, it could be tuned on a larger scale to drive massive turbines or enhanced with the use of mirrors. Please add your thoughts and constructive feedback to this solar thermal water wheel concept below and help drive the discovery of renewable energy sources. Note the key phrase ‘hyper efficient water wheel’, and the subsequent silence on what that might be. The rotational inertia of, say a 1kw generator, is significant. You’d require significant volume of water to make that move. Perhaps an aggregate of motion generators would be more suitable, I don’t know. It’s a good idea worth exploring, in any case. The gravity potential of 6ft or so is not to be underestimated – the exact factor that will put structural stress on a house. At any rate, solar power is indeed a renewable source of energy, we should have to use it wisely.